I have been told quite frequently that I am socially awkward. That I can somehow appear uncomfortable in almost any situation. I am so awkward with myself that some people actually laugh at me because they find it amusing to see me uncomfortable. Maybe they find me endearing. I don’t know. And she always says I have a sheepish look, just like my dog form, who always look sheepish no matter he does. And she would always give me an incredulous ‘Tsk tsk, why like that, huh?’ expression after that. At which point, I would look down at my feet and grin sheepishly, wondering why too. Maybe being awkward is really my true talent in life? I should have a reality TV show to track all my awkward behaviours. It’d be terrible but hey, if people can find the Kardashians interesting, surely my awkwardness can find a niche audience somewhere. Plus, I have been told by many I have excellent fashion sense. So I can be an awkward eye candy? 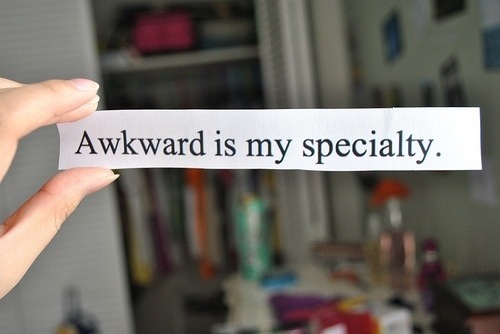 Maybe some of you would be thinking how and why I would describe myself as awkward. The truth is I don’t really know. I just am. I can wear the best-looking suit and most dashing shoes to work and still look out of place at a posh event. Presentable, but inept at being a fluttering eloquent social butterfly. Maybe I am too self-conscious because I think I have a horrible thick boorish accent. I sometimes feel that I speak as though I hail from a rural land where English is the third language. It gets worse when I have to address a crowd of corporate people, I feel even more like a country bumpkin in an ill-fitted suit. But with really, really good hair and a winsome smile. Weird, I know. I also dislike air kisses. A naturally awkward person should never attempt to air kiss under any circumstances. True story.